Yesterday, the midday meal was a traditional one for this time of year. We have written about Onam festivities each of the years that we have been based in Kerala, since 2010. 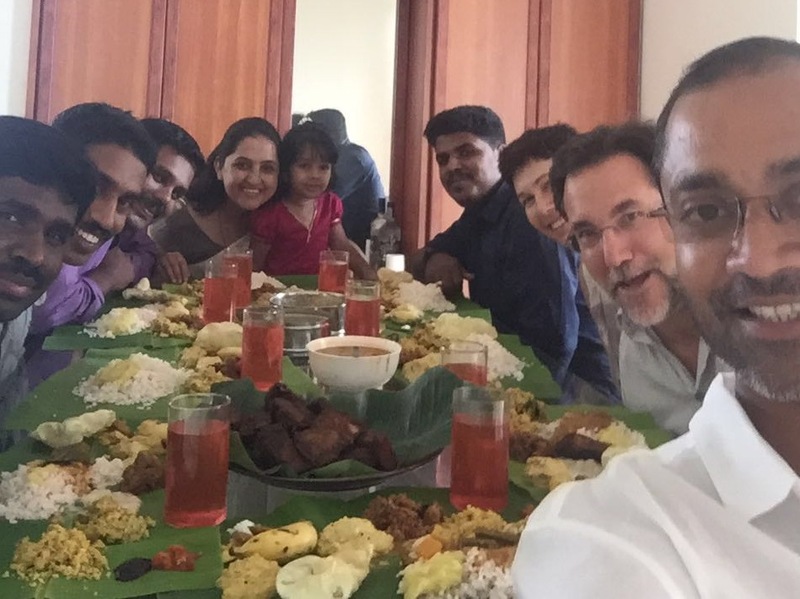 Now, during our seventh such celebration, we finally hosted an Onam feast in our own home. In order to be sure that the guests at our table would have the best of the traditional foods of the season we made the only sensible decision: we ordered the feast from a local kitchen we favor. These dishes, which we have written about in previous years, tasted as if they were the best we have yet had. Maybe because it was all so easy and pleasant. Our guests, anyway, we knew to be not high maintenance. It was a cross section, functionally speaking, of La Paz Group’s Kerala team, including (from left going around the table in the picture below) engineering, finance, revenue management, reservations, sales, design, me, and front right is the man in charge of it all, who was also the photographer. So, a zero-stress celebratory lunch. No utensils. Plenty of seconds on favorites. And then, like its American counterpart Thanksgiving, best followed by a nap. Which happened. This morning I took my regular morning walk, which starts at our residence at about 6am and makes an 8km loop starting in our lovely, quiet neighborhood, then across the water by bridge to our old neighborhood, Thevara. Just out my gate, about 50 meters from my starting point I saw this first sign of the community decorations that are typical of this day (below). Our neighbor down the street had made this in front of their gate, which has a trail going inside the closed gate to an alter they created for the day. Most gates, when there are gates, are open as in the image below. Trailing flower petals seem to be as important as the more detailed and intense pookalums seen everywhere. …until that trail (above) leads to this home (below). Among other sentiments of the day, one feels privileged to walk the path, especially when it leads to friends in the neighborhood showing off their artistic talents and devotional intent. In Thevara, about half an hour from my starting point, the homes belong to fishermen and their families, so the exteriors are not fancy but the flowers light things up. Not every home has one, but most have something festive to show, and more than half have a pookalum just inside the entryway. On a larger street, it is a process of zigzagging across the street to see who’s done what. Inside that gate, above, is this pookalum below. My favorite spot in our old neighborhood is the community library, which also doubles as the reading room favored by the local chapter of the communist party, which won the most recent statewide elections. Trying to keep the pace of my walk, while saying hello to old friends and admiring their decorations, means that my telephone snapshots have mostly come out blurry, but no matter. It is never about how much you have, but how you celebrate what life has provided you, and fishermen seem to recognize that more than most. The man seated with his two daughters in front, and older son behind, was one of my first friends in the neighborhood in 2010. The daughter on the left was an infant then, and the one on the right was not even born then. The home in the background was not yet built, either. They had lived in what would be called a tin shack for the first couple years. But fishing has been abundant, in relative terms, and he now has a solid home and a closeknit family. The kids all greet me in refined English, which means they are getting an excellent education. Something right is happening here. I keep my pace. Gate closed. They must be sleeping in. No gate here. No one home. I move on.